There’s one less brunch option along West Third Street this week, as longstanding option Doughboys has officially closed its doors. Not to fret though, because the company appears to have other, even more casual plans in the works down the line. This has been a very difficult and emotional decision for the owners to make but one that is necessitated by business circumstances. Continual rising costs — food, labor, and operating expenses — have made our business model of serving ‘great food in large portions at a great value’ impossible to continue to maintain. It’s a sad end for the decades-old restaurant, which operated for many years under owner Frank Waldman before closing in 2007. New owners came around 2010 to return the space to its former glory, but ultimately succumbed to rising rents and higher operating costs themselves. The final day of service was last Sunday, but the note below does hint at Doughboys on the Run, an either mobile or supremely fast-casual version of the famous name to potentially land sometime down the line. “Doughboys Turns Off the Mixers After Decades Along West Third.” Eater LA – All. 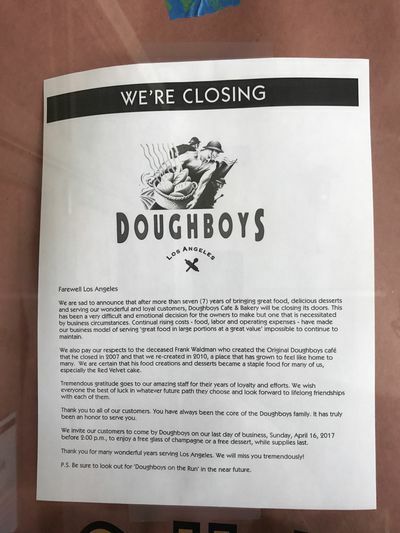 http://la.eater.com/2017/4/18/15347150/doughboys-west-third-closed-los-angeles.